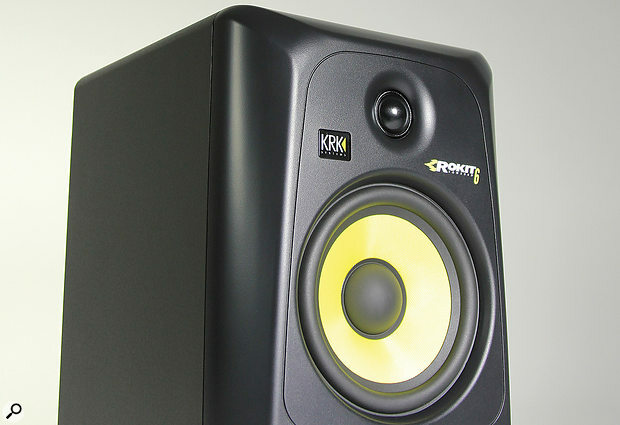 KRK’s distinctive–looking Rokits have long been popular in home studios. How does the newest generation fare? KRK may have been bought by the Gibson empire, but the Rokit 6 G3, the middle speaker in a range of three that also includes a five–inch and an eight–inch model, is still very recognisably a KRK design. 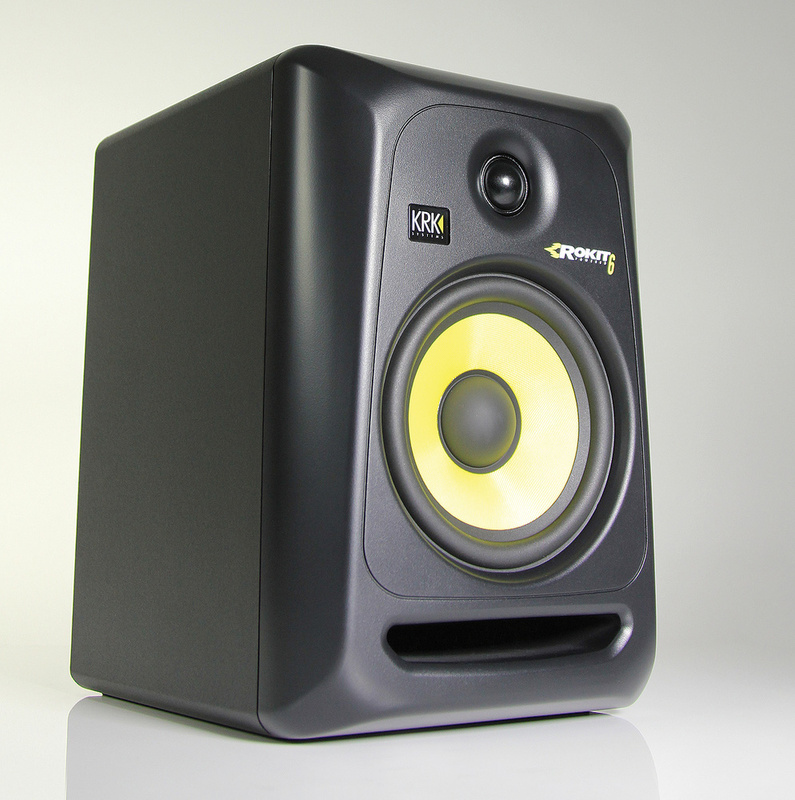 This two–way, active monitor, the third incarnation of the Rokit 6, is priced to appeal to the budget–conscious home–studio owner, but the general design philosophy follows that of KRK’s existing monitors. This model teams a one–inch soft–dome silk tweeter with a six–inch woofer built around KRK’s glass–Aramid composite cone material. With an impressive 47.5Hz to 34.5kHz working frequency range (–3dB), the Rokit 6 is bi–amped via a conventional Class–AB amplifier with total power just shy of 75 Watts. The woofer is driven from a 48W power stage and the tweeter from a 25W power stage, via an active crossover operating at 2.3kHz. The specifications reveal that the speakers are capable of SPLs up to 107dB — which is more than enough for comfort when working up close. A waveguide is used to match the tweeter dispersion to that of the woofer at the crossover point, while the frontal bass port reduces the detrimental effects of mounting the speaker close to a wall. There’s no radical departure from established engineering principles here; the cabinet is rectangular and built from MDF with a resilient sheet bonded to the base, and the porting looks conventional — this two–way, ported, active format is employed by the majority of near–field monitor designers. As always, the designer’s real challenge is to juggle the compromise of cost versus performance in the best way possible. 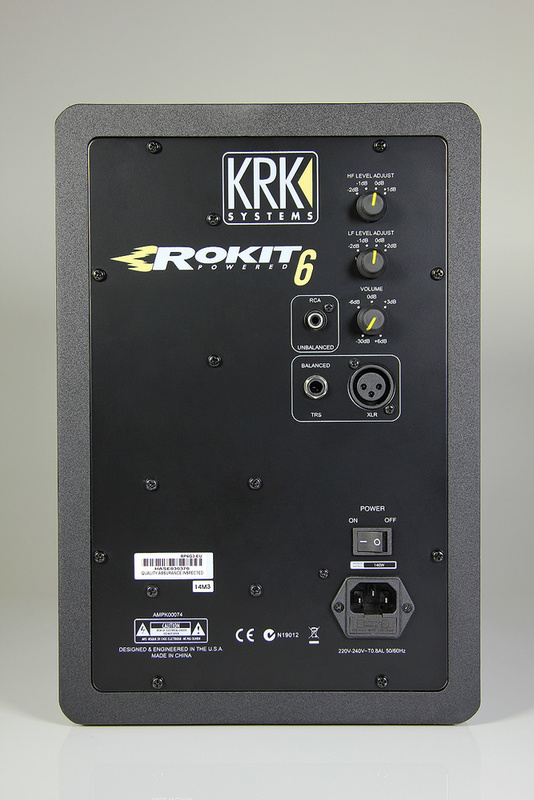 The Rokit 6 G3s have a variety of input connection options, and also feature some useful tone–shaping EQ controls.Taking a closer look, the speaker baffle is inset into a larger baffle moulding with strongly contoured edges to reduce diffraction, and also to impart a degree of visual style. The woofer, with its distinctive yellow woven cone and neoprene surround, is slightly recessed, while the slotted port below it is also moulded into the baffle. An illuminated KRK logo shows when the speakers are powered up. A standard–black vinyl foil covering is applied to the rest of the cabinet, which has rounded corners and an overall size of 290 x 226 x 332 mm. The weight is 8.4kg per speaker. There are no surprises on the rear panel, which is a large metal plate doubling as a heatsink and support for the connectors and controls. Mains power comes via the expected IEC socket and switch, and the voltage is fixed according to the region of purchase. An auto–mute system puts the speakers into a low–powered sleep mode if they are unused for more than 30 minutes. All the common flavours of input connector are supported so you can get in via separate balanced XLR, balanced quarter–inch jack or unbalanced RCA phono sockets. A degree of adjustability is provided by a gain control with a –30 to +6 dB range, and a four–position HF level switch with settings at –2dB, –1dB, 0dB and +1dB. The lows can also be adjusted to compensate for placement within the room, the options being –2dB, –1dB, 0dB and +2dB. 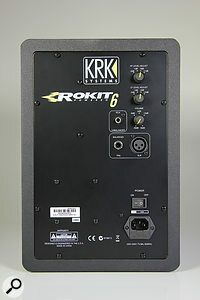 The performance of the Rokit 6 G3 has to be evaluated within the context of its selling price, which places it in the entry–level camp. So while these speakers don’t create quite the same impression of a 3D sound stage as high–end speakers, nor do they exhibit the same sense of sharp focus, they do deliver a good overall tonal balance with clarity in the highs and decent stereo imaging. I found the lows to be in keeping with a speaker of this size, though, being critical, there is some sense of lower-mid–range congestion just above the bass region which can, on some material, take on a slightly boxy character. As a desktop speaker for the small studio, the Rokit 6 G3 has much to commend it for the user on a tight budget. Setting the speakers on isolation platforms helps firm up the bass end, and those rear-panel EQ controls are actually very useful in balancing the tonality against the room characteristics. I also appreciate the choice of input-connector options. If you can afford it there are KRK monitors at a higher cost that outperform the Rokit 6 G3s, but if your budget is tight, then they deserve consideration. Competition includes the Alesis Monitor One MkIIs, the Fostex PM series, M–Audio’s BX5 and the Tannoy Reveal series. Plenty of connection and EQ options. Less clarity than more expensive speakers. Like their predecessors, these revised Rokits are a very viable monitor option for people on a budget. £299 per pair including VAT.